In the future, Time Sensitive Networking (TSN) or its substandards will make it possible to supplement traditional Ethernet with real-time features, even at high data transfer rates up to the gigabyte range. In addition to real-time capability and determinism, TSN offers other tremendous technical advantages. ETHERNET DISCUSSIONS ARE GIVING RISE to increasing demands for secure data transmission and real-time. This is where the issue of time sensitive networking (TSN), a combination of several substandards developed within the framework of the IEEE 802 Time-Sensitive Networking Task Group (TSN TG), comes into play. The aim is to put all industrial communications on a uniform basis by combining classic Ethernet with the real-time functionality required for industrial communications. Here, guaranteed latency and a corresponding determinism are the crucial parameters. These are no longer achievable with classic Ethernet, especially under high network load, since conventional switches usually buffer the messages before they are seen, where they need to go, and when the message forwarding takes place. However, new applications, especially in times of IoT and Industry 4.0, require technologies that allow bandwidth assignment to be controlled much faster and more accurately. In the future, TSN or its substandards will make it possible to supplement traditional Ethernet with real-time features, even at high data transfer rates up to the gigabyte range. In addition to real-time capability and determinism, TSN offers another tremendous technical advantage. Various TSN Substandards as currently defined within the TSN Task Group. The ability to scale networks allows TSN to operate at 10 Mbps, 100 Mbps, 1 Gbps, or 10 Gbps. However, this requires a detailed and thus more complex network configuration. Transfer rates of 1 Gbps and more are a logical evolution of today's networking. 1 Gbps opens the way for new (IoT) applications and helps to overcome performance bottlenecks in data-intensive applications. However, TSN as a system can only be fully effective when both the terminals and the Ethernet switches support the TSN functions. The complete TSN package consisting of the illustrated substandards is currently not finished. 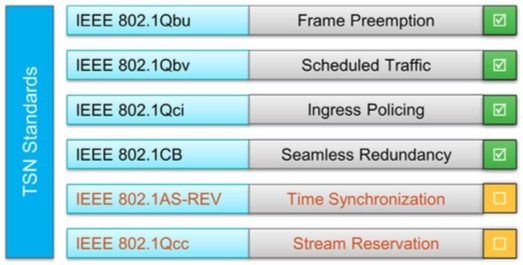 The two substandards IEEE 802.1AS-REV (time synchronization) and IEEE 802.1Qcc (stream reservation) are still under discussion within the IEEE 802.1 Time-Sensitive Networking Task Group. It is difficult to estimate when these open substandards will be fully defined. However, the work should be finished by mid-2019. Nonetheless, even with the current state of TSN standards, an upward-compatible further development of standard Ethernet has been created according to IEEE 802.1. For example, the recently adopted substandards provide an interoperable method of synchronizing the clock signals distributed throughout the network. At the same time, they allow for a deterministic real-time on a shared transmission medium that is also used by other devices. TSN thus regulates the data communication in Layer 2 of the ISO/OSI reference model. OSI 7 Layer Reference Model. 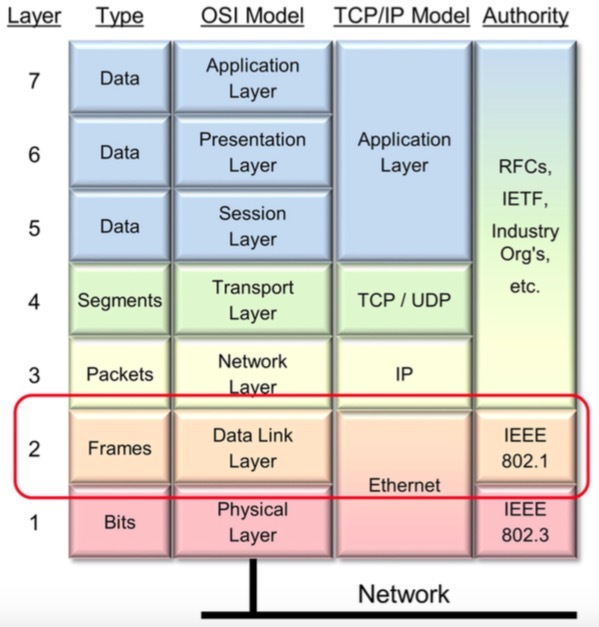 Strictly speaking, TSN represents a real-time capable layer 2 in Ethernet, but not a complete real-time protocol. That is, TSN will not replace PROFINET, EtherNet/IP, and comparable Ethernet protocols. Rather, these industrial Ethernet protocols will support TSN in layer 2 in the long run. Classic industrial Ethernet protocols will therefore not disappear, but in the future will be built upon TSN. Fieldbuses, on the other hand, are likely to be permanently displaced by Ethernet. In order to be able to support all the industrial standards in the future, special, flexible hardware in the form of user-specific ASICs is required. 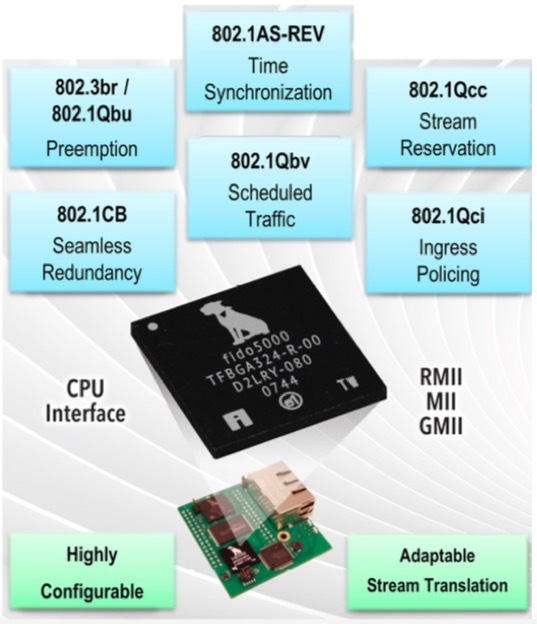 An example of this is the elegant multiprotocol chip solution fido5000 from Analog Devices. The hardware required for TSN has already been integrated into this Ethernet switch chip. Once all substandards have been fully defined, this chip can be adapted without much effort through a firmware update. It is thus well equipped for TSN and therefore TSN ready. Real-Time Ethernet Multiprotocol Switch Chip fido5000 and its preconfigured TSN substandards. However, in order for the transition from standard industrial Ethernet applications to TSN to be gradual and as simple as possible, the standardization bodies provide models for how existing plants can cooperate with new TSN-based devices. This involves the use of unified layers 1, 2, and 3 of the ISO/OSI reference model, which allow for completely new approaches in terms of scalability and performance. However, this requires that the entire network and all its components, such as switches, support the various communication protocols. This enables a unified, deterministic infrastructure, and the TSN networks can leverage their advantages over traditional standard Ethernet. However, due to the not yet fully defined complete TSN standard, many companies are currently reluctant to implement TSN. The conversion will probably take some time, although terminals can already benefit from TSN networks, as determinism and real-time capability are already available thanks to existing TSN switches. Therefore, there is no question that TSN will be a future Ethernet standard. The only open question is when will the complete TSN package be ready and find appropriate applications in industry? Thomas Brand, Field Application Engineering, Analog Devices.